The Westminster Dog Show Will Now Include Cats! Believe it or not! This month, cats will make an appearance at the Westminster Kennel Club Dog Show. While the cats won’t be competing with the dogs, they will have their own special part of the Dog Show. The cats will be on display in the Meet the Breeds event on February 11th in New York City. The events gives the public an opportunity to meet and play with 35 different cat breeds! The International Cat Association is teaming up with the American Kennel Club for the event, with more than 35 cat breeds on display. It’s a break from 141 years of tradition. The cats will be part of a showcase designed to educate the public about different types of cats and dogs, called Meet & Compete. In addition to the Westminster Kennel Club and American Kennel Club present Meet & Compete on Saturday, February 11th, Westminster Week events include the iconic 141st Annual Westminster Kennel Club Dog Show on Monday and Tuesday, February 13-14 and the Masters Obedience Championship at Westminster on Monday, February 13. All events are presented by Purina® Pro Plan®, which is dedicated to helping dogs of all activity levels excel through performance nutrition and expert resources. The cats are being included in the event as a way to learn more about them. The American Kennel Club describes the event as an “opportunity to meet and play with hundreds of adorable dogs and fabulous felines while learning about responsible pet ownership. The cats have been part of a separate event previously, but now will share the showcase with the dogs, Westminster Kennel Club. The fans are able to see dogs and cats and talk to breeders about which kind of animal would be best for their lifestyle. Or they can just pet the animals. The exhibition also includes some fancy footwork from the felines. They will be putting on a cat agility demonstration where the cats are being led through an obstacle. 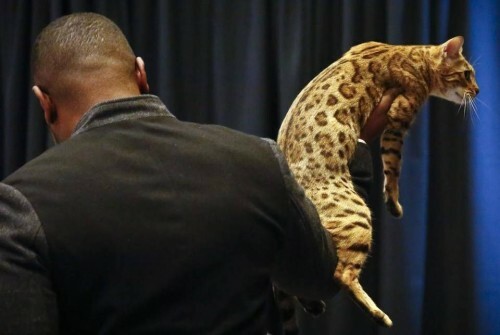 One of the participants is a particularly striking Bengal cat, who has the memorable name of Jungletrax Abiding Ovation. Apparently, there’s no reason to worry about safety because the two species will be kept apart. And it helps that they cats, for the most part, are show cats, so they’re very well-behaved, well-trained. And, of course, the show dogs are also well-behaved, well-trained and will be monitored by their trainers. It seems like every day, cats are getting their equal place among dogs. Even, just recently, there was a study about cats being as smart as dogs. We cat lovers applaud the efforts!